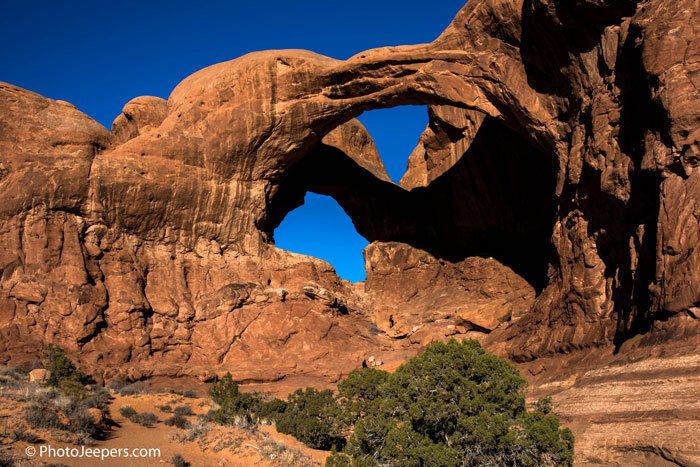 Located close to Moab, Utah, Arches National Park is a wonderful place to visit! The rock formations will mesmerize you! 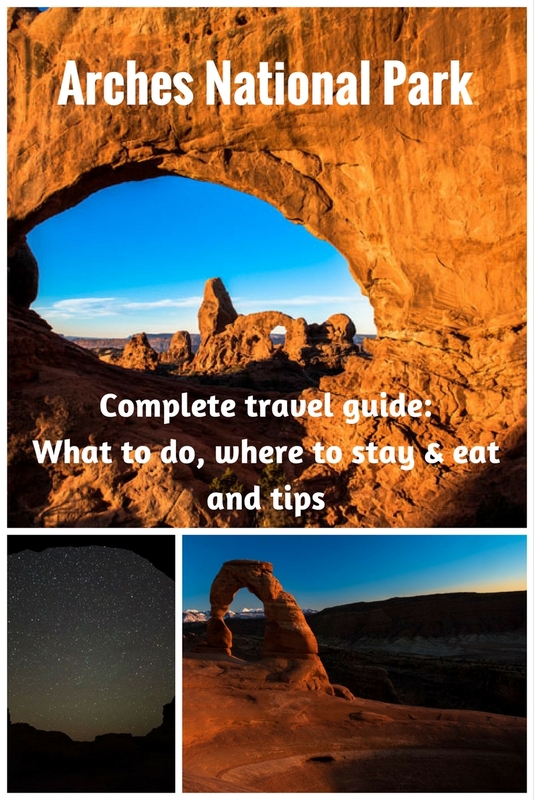 Here is a complete travel guide to Arches National Park with all you need to know: what to see, where to stay, where to eat, and tips from David and Jamie, Photo Jeepers who also wrote a complete travel guide to Moab, Utah. Arches National Park is located 4 miles outside the town of Moab, Utah. 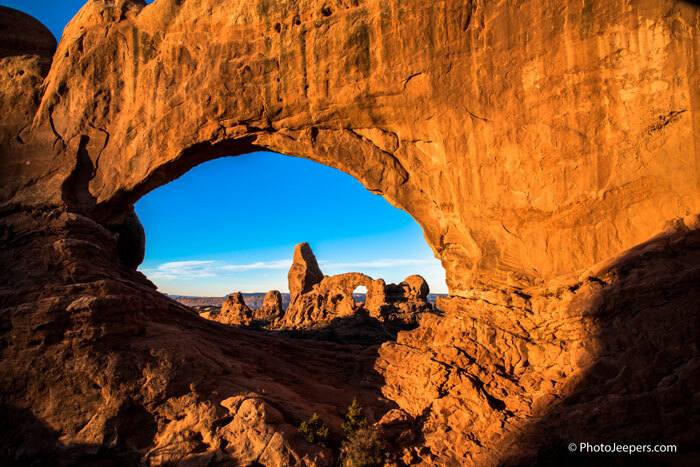 The park is known for its 2,000 natural stone arches, massive rock fins and other rock structures. Explore the park early or late in the day when the lighting is best for photography and the temperatures are best for hiking. The rock formations pop with color, there aren’t as many people in the park, and you avoid the intense sun and heat of mid-day. The park is a high desert, high elevation environment. It’s important to stay hydrated, wear layers and protect yourself from the sun with hats or sunscreen, even in the winter. The scenic drive in Arches National Park is paved and 43 miles long, which includes the spur roads. Plan 2 to 3 hours to drive the road and photograph the sites from the pullouts or in the parking lots. Some arches and landmarks may require a short walk from the parking lot. 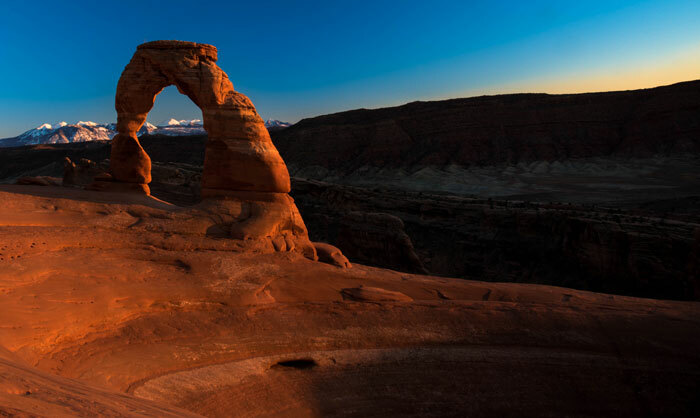 Add more time if you plan to do any hiking like Delicate Arch or Devil’s Garden. Balanced Rock is hard to miss as it’s located next to the main road. It’s one of the most popular features in Arches National Park due to it’s accessibility. Walk the easy, short loop trail of .3 mile round trip that takes you up to, and around, Balanced Rock. Keep in mind the balanced, upper portion of the rock is as large as three school buses. 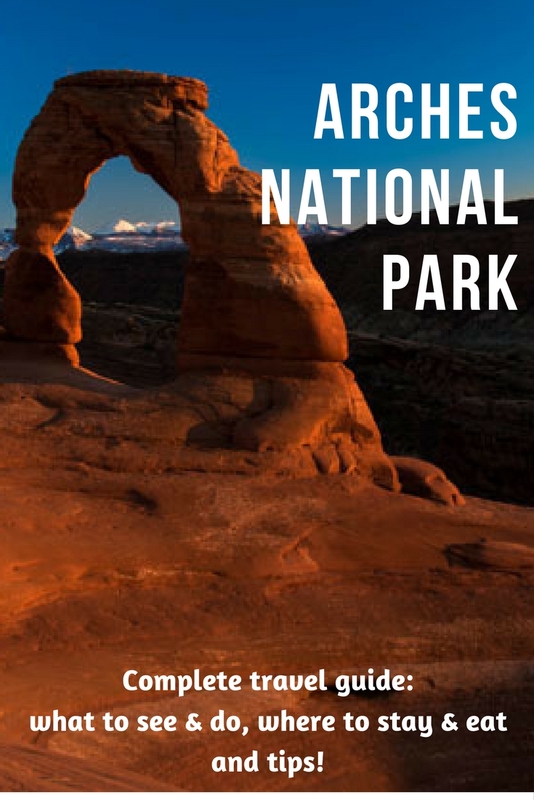 The main thing visitors want to see at Arches National Park is usually Delicate Arch. 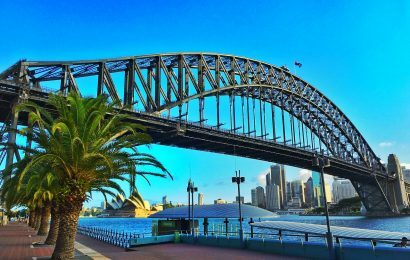 The famous free-standing arch cannot be seen from the main road; you must get out of the car to view it. At the Lower Viewpoint walk 100 yards along a level path to view the arch one mile away. At the Upper Viewpoint walk ½ mile, which includes some stairs. The trail to see the arch up close is 3 miles roundtrip. It climbs 480 feet in elevation, much of it along slickrock, and takes most people 1.5 hours to reach Delicate Arch. Be prepared with water, sun protection and layers. Because Delicate Arch is a popular destination for tourists and photographers, it’s important to practice patience and courtesy. During the summer there may be hundreds of people and photographers lined up along the bowl waiting for sunset. 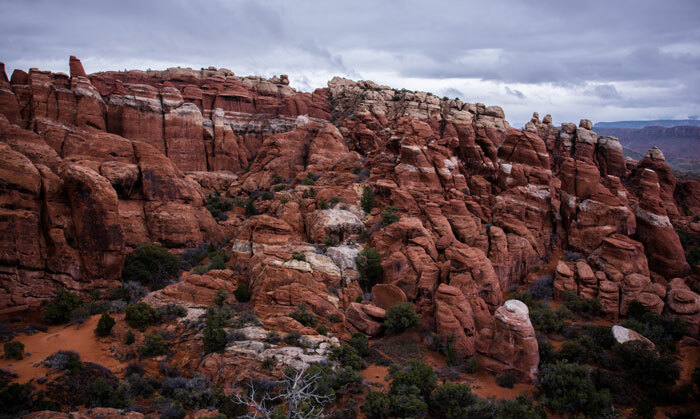 Explore the narrow canyons and maze-like fins in the Fiery Furnace on a ranger-led hike for which advance reservation is necessary. During the 3-hour hike you will learn the history of the park as you climb over boulders, hike along sandy trails, squeeze between rocks and walk along narrow ledges. If you prefer something a bit easier, the Fiery Furnace Viewpoint is a short walk from the parking lot where you can see the fins and spires. Access Landscape Arch by walking 1.6 miles along the Devil’s Garden Trail. This amazing arch is longer than a football field with the thinnest part being 8 feet thick. There are many opportunities to photograph various angles of the arch. Years ago visitors were able to walk beneath the arch, but falling rock from the underside makes it too dangerous now. The Devil’s Garden Trail is 7.2 miles round trip, including all spur trails. It is the longest maintained trail at Arches National Park. Devil’s Garden includes the largest concentration of significant arches in the world. The first mile takes you to Tunnel Arch, Pine Tree Arch then Landscape Arch. After this point the trail becomes more primitive and requires climbing up and over fins – long, narrow sections of slickrock with steep drop-offs. Along this section of trail you will see Navajo Arch, Partition Arch and Double O Arch. Explore the Windows area along the 1 mile round trip trail. You will see North and South Windows, also known as the Spectacles. It’s easy to see the windows from the parking, but take time to hike close to appreciate their massive size. Take the primitive trail from the South Window to the back side to see a another view of the windows. The only time to get photos of the windows without people is to arrive early as this area is easily accessible and very popular. Double Arch consists of two arches that share the same stone foundation. It was formed by downward water erosion which is different from the other arches that were formed by side-to-side water erosion. At the beginning of the short, easy trail to Double Arch you pass the Parade of Elephants. 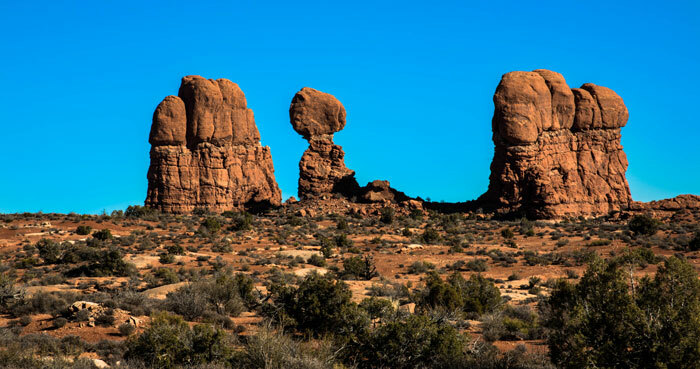 This is a rock formation that resembles a herd of elephants holding each others’ tails. 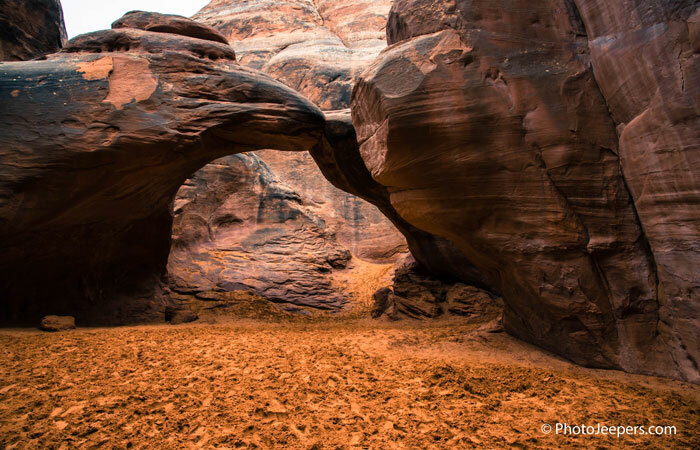 Sand Dune Arch is often overlooked, but it’s one place in the park that provides shade, cool sand and fun areas for adults and kids. The short, easy trail takes you into a small slot canyon with many areas to explore, play and hide. Don’t forget that climbing on top of arches is against park policy. Arches National Park is recognized internationally as a Dark Skies Park due to its accessibility, remote location, altitude and weather. 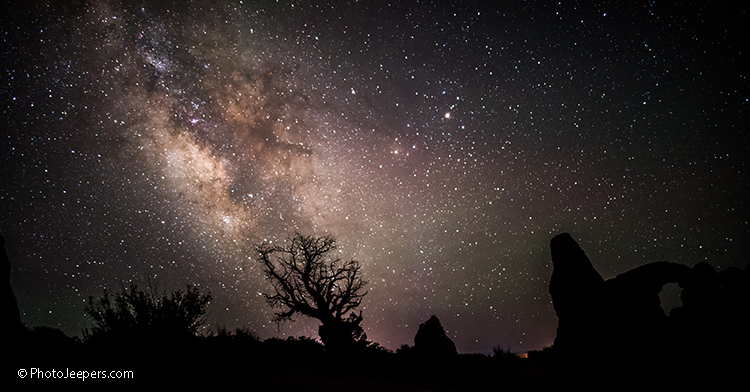 Plan to visit the park after dark on a clear night and LOOK UP to see the sky is brimming with stars! There are no restaurants or stores in Arches National Park. The nearest restaurants and stores are in Moab, Utah, about four miles from the park entrance. There are several areas with picnic tables in the park. 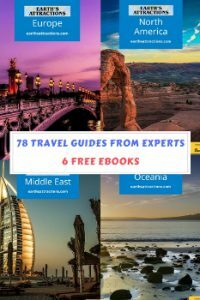 You can see a full list of places to eat in this article on Moab, Utah. There are no lodges in Arches National Park. There is one 50-site campground at Devil’s Garden. Between November and February, the camping sites are first-come, first-served. Camping sites can be reserved from March through October. The nearest hotels and camping options outside the park are in Moab, Utah, about four miles from the park entrance. We visit Arches National Park multiple times each year and recommend visiting during the winter off-season. 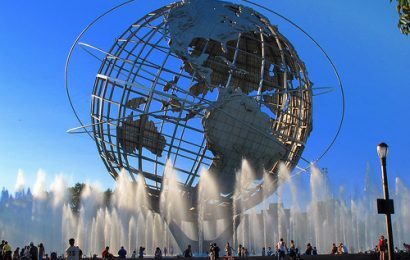 If you must visit during the summer where temperatures can reach 105 degrees, hike in the morning or late afternoon. Most areas and hiking trails in the park do not have places to find shade. Arches National Park is filled with visitors from spring through fall. Practice patience and courtesy with fellow travelers at the entrance gate, at parking lots and along the trails. The arid high desert landscape at Arches means the nights are cool and the days are warm to hot. Be prepared for extreme elevation and temperature changes, sometimes over 40 degrees in a single day. Always stay hydrated, wear layers and protect yourself from the sun with hats or sunscreen, even in the winter. Arches is so cool – I went there as a teenager and I’ve lot go back. 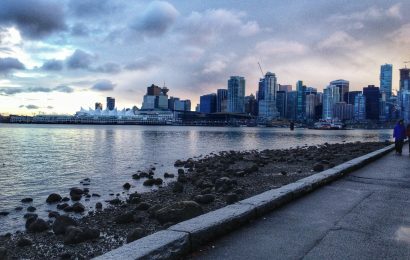 Thanks for sharing such lovely photos of such a compelling and magical place!